Introduction: Looking to purchase a decent flipping reel, but not quite sure you want to deal with the inevitable and ever irritating backlash? Shimano�s Bantam Castaic may be what you�re looking for. Impressions: I more or less stole this reel from my dad about eight months ago. Ever-since, I�ve been teaching myself how to use a bait casting/flipping reel the hard way; which turns out, wasn�t so hard after all. 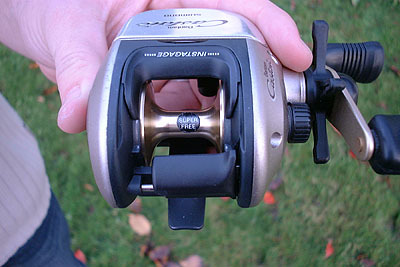 If you�re familiar with a standard casting reel, then you should easily identify the difference on this Castaic. Instead of a single directional clutch bar, Shimano designed in a bi-directional one. So rather than stopping the spool with your thumb after completing a cast, you can stop the spool from spinning simply by flipping the clutch bar back to the �lock� position. More accurately, there is a thumb switch that is located above the clutch bar in which you move your thumb forward to engage the spool to the drive gear. Shimano calls this �INSTAGAGE�. 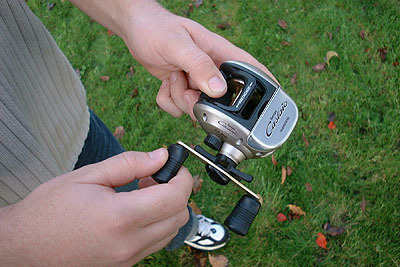 With the �instagage� switch, actually stopping the spool instantly is much easier than on a standard casting reel. For me, I thought this feature would be sort of like training-wheels, getting me ready for a �real� casting reel. 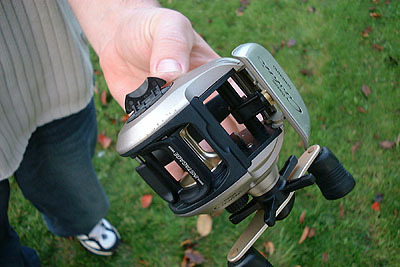 The details: The first nice and surprising feature of this reel is the �flip-open� thumb rest. I actually didn�t find out about this feature until I had my first major backlash mishap. The thumb rest easily opens up to fully expose the line guide, making it less of a task untangling nasty backlash and looping the line through the guide. This feature is really a necessity though since the �instagage� bar takes up about three eights of an inch over the spool. One thing to remember about this reel when shopping, is when you see the �Super Free� sticker, it doesn�t always mean that it is really �Super Free�. As is the case with this reel, there is a sticker on the spool that indicates that it is �Super Free�. However, it is clear that it is not �Super Free� at all. You can test this a couple ways. You can take the spool out to examine the drive or you can simply spin the spool with your finger to see if it spins quickly and for a long time with little resistance. Looking at the Castaic in more detail, especially after analyzing it after a several months of use, I can only commend excellence of the craftsmanship and quality. It demonstrates the same quality that I have always come to expect from Shimano since I started working with their bicycle components years ago. I have not been easy on this reel either. I can recall dropping it several times both on the ground and in my canoe. So some paint was dinged off, but it still looks pretty good. All the mechanical aspects of the reel are still in excellent working condition. The main frame is made of magnesium alloy and the internal shifting platform is made from a very hard black plastic. The thumb rest is made of magnesium alloy as well, but it covered esthetically with aluminum. The star drag is made of the same hard, black plastic while the cast control cap is made from a softer shiny plastic. The plastic clutch bar is my only gripe about the reel, and I hope Shimano can offer a solution some day: it is only held in position on one side, leaving the left side of the clutch bar un-supported. This causes it to bend down, to the left over time, which then causes scraping on the inside right. This may become a problem down the road, but for now it is just a little annoying. Taking the real apart for this review gave me a chance to service it for the first time. After about 20min of cleaning and lubricating with some cue tips, the reel spins and feels smoother than when it was new. Conclusion: I recommend this reel for anyone looking for an easy-to-use bait caster for close range casting distances of less than forty feet. It should last for a life-time of flipping as it is taken care of. The Castaic offers increased control over casts and flips over short distances and in the proper hands can be a lethal flipping machine! If you are a beginning bait caster this reel almost makes it casting too easy, but for those who may have had difficulty with other baitcasters, the Castaic with its user friendly features can once again make you a believer!